A man who worked for the New Jersey Department of Corrections grabbed an officer's gun and opened fire inside the Gloucester Township Police station early Friday, injuring three officers before being shot dead. 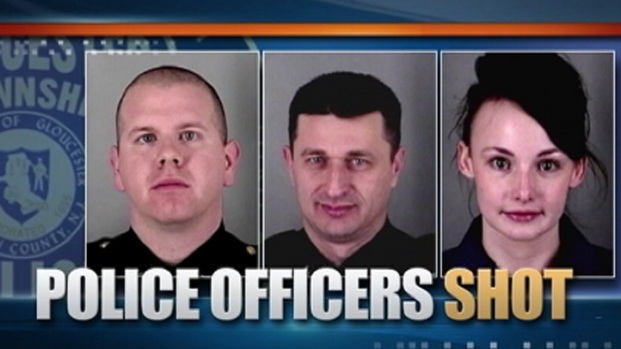 The officers involved in the incident were Sgt James Garber, a 13-year veteran; Sgt. James Kevin Thyne, an eight-year veteran; and Officer Ruth Burns, a rookie. "Their actions of protecting the community quickly escalated from responding to call for service to performances of heroic actions by members of this police department," Chief W. Harry Earle said at an afternoon press conference. Police say Officer Ruth Burns was processing Eddie Jones III, when he grabbed her gun and shot her along with Sergeant Kevin Thyne and Sergeant James Garber. NBC10's Christine Maddela shares the story. It all started as a domestic violence call just after 1 a.m. when township police responded to a residential home for a report of a suspicious person. Investigating officers pulled over a man matching the description of the suspect. Eddie Jones III, 39, of Willingboro, N.J. was arrested on suspicion of stalking his ex-girlfriend and other charges. He identified himself as an employee of the state Corrections Department, where he worked as a non-sworn in officer, Earle said. The shooting followed inside the police station around 5:30 a.m. on the 1200 block of Chews Landing Road. Part 1: Dispatch Tapes – "We Have at Least One Man Down"
Part 2: Dispatch Tapes – "Officer Shot"
Part 3: Dispatch Tapes – "Officer With a Gun Shot Wound"
"A violent struggle occurred while the suspect was being processed," Deputy Chief David Harkins said. 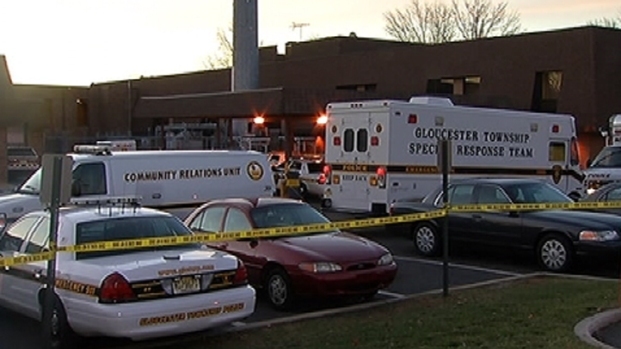 The three officers injured in the shooting at Gloucester Township Police Department were taken to Cooper University Hospital. NBC10's Tim Furlong updates you on their conditions. Police say Jones' handcuffs were briefly removed -- a standard procedure -- so he could be processed. At that point he suddenly overpowered Officer Burns, knocking her to the ground, hitting her in the head and taking her weapon from its holster, Earle said. The two sergeants heard the commotion and came running into the processing room, Earle said. "Eddie Jones continued rapid fire at the officers while Sgt. Garber and Sgt. Thyne returned fire," Earle said. 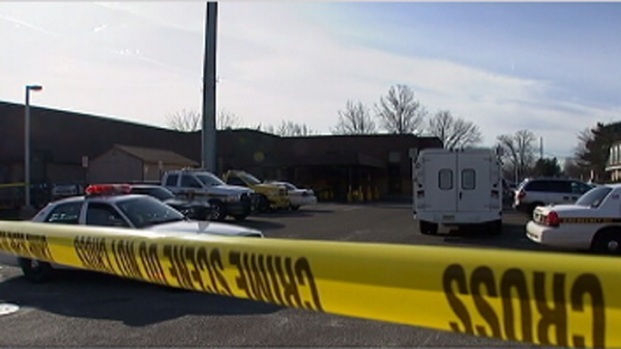 Three police officers and one suspect were shot when gunfire erupted inside the Gloucester Township Police Department. 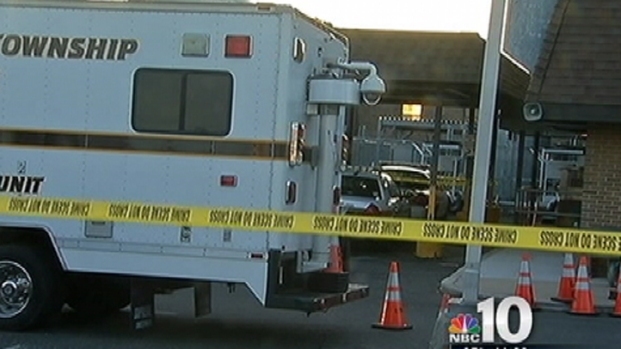 The gunman, who worked for the New Jersey Department of Corrections, was killed by police. NBC10's Rosemary Connors reports. Burns was shot in the foot during the barrage of bullets. Thyne was hit on his duty belt causing a laceration to his stomach and suffered a graze wound to his chin. And, Garber was shot in his bulletproof vest, in the abdomen and suffered a graze wound to his head. Jones died at the scene after being shot multiple times. Police said that Burns and Thyne were treated a released. Garber underwent surgery for his stomach wound at Cooper University Hospital where he remained in stable condition Friday afternoon, according to police. Three police officers were shot inside the Gloucester township police station, Friday morning after a confrontation with a suspect. All three officers were treated at Cooper University Hospital. Two have been discharged, and one is listed in stable condition after undergoing surgery. The gunman was killed by police. NBC10's Rosemary Connors reports. A spokesperson for the hospital said that there were several puncture wounds in the officer's vest. "I'm so proud of the actions these officers because they placed themselves in harm's way to save the lives of their fellow officers, police dispatchers and the general public during this escape attempt," Earle said. The N.J. Department of Corrections said that Jones worked as a civil communications officer at the Garden State Youth Correctional Facility in Chesterfield, Burlington County. He had worked at the DOC since September 1997. Deputy Chief David Harkins describes what happened during a shooting at the Gloucester Township police station Friday morning. Three officers were shot and the gunman is dead, according to police. Family members say that Jones had two daughters. According to court records, he was sentenced to four years probation after pleading guilty to resisting arrest in Camden County back in 1995.